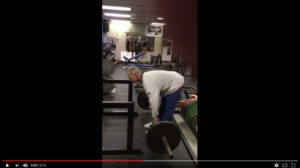 Question: Stiff leg deads hurt my back because our coach wants our hands to touch the floor. Coach said that’s how a friend of his that coaches at an SEC school says to do them. What muscles are they supposed to be working? Answer: Stiff leg deads, also known as Romanian, Russian or Bulgarian deadlifts, are intended to primarily work your glutes and hamstrings. The lower back should be affected as a secondary working group. There are two versions of the RDL: one during which you lock your knees that will emphasize the hamstrings and the other allows your knees to remain slightly bent or unlocked. The second version is used more in school weight rooms and for teams and it does a good job of working the hams and glutes. It’s not as effective as keeping your knees locked though. The bent-knee version tends to be less stressful on your lower back when the exercise is performed correctly. Yours is not the case. The problem you’re personally dealing with is the misconception that is held by some trainers and coaches that this is a vertical exercise. That means the focus of the movement is to lift and lower the weight. Your coach takes it even further if he wants your hands to get to the floor. This means that you’re standing on a platform. To get your hands to the floor or even to perform this as a vertical lift means that your ribcage collapses and your lower back will round out stressing the lumbar region instead of fully loading the hamstrings and glutes. To properly perform the exercise, keep your ribcage lifted and your back flat through the full range of motion. Do not allow your shoulders to round forward. Imagine that your hips are connected to a rail and you’re driving them backwards. This stretches the hamstrings and glutes forcing them to carry the majority of the resistance. The bar will only go as low as mid-shin if you’re driving your hips back and your hamstrings will be fully stretched. Return to standing position be pulling your Hips forward again. The movement should be controlled both in driving the hips back and then pulling them forward. The bar rises and falls because of the horizontal movement of your hips. Check the video for proper form. Cut this article out and anonymously put it on your coach’s desk.